LAMP is a group of open source softwares installed together to build a webserver. LAMP refers to Linux (Operating system), Apache (Web service), MySQL/MariaDB (Database) , PHP (Programming language). This guide helps you to install LAMP server on centos 7. Before starting installation, you need to setup Static IP and hostname . You can also refer this guide – Setup network on centos 7 to setup static ip and hostname. Install LAMP server on centos 7. Step 2 » After updating repository, issue the below command to install apache package. Step 3 » Now start the service and enable it at startup. Step 4 » By default, Apache will listen on port 80. you need to exclude from firewall. you can simply exclude http service from firewall. Step 5 » Now restart firewall service. Step 6 » Apache installation is over . For testing, open http://serverip in your browser, you can see apache demo page like below. Step 7 » Start installing MariaDB, MySQL drop-in replacement. Step 8 » Now start the service and enable it at startup. Step 9 » Secure your DB installation. Type the below command and provide values. [root@krizna ~]# mysql_secure_installation1. current password ( Leave blank and hit Enter ). and Hit enter for all the other options. Step 10 » MariaDB installation is over. For testing, Check login into DB using the below command. Step 11 » Install PHP and other recommended packages. [root@krizna ~]# yum install php php-mysqlAdditional packages are required if you would like to install phpmyadmin . Step 12 » Now restart apache service. Step 13 » For testing, Create a file phpinfo.php in /var/www/html/ ( Default root directory ) and add the below code. <?php phpinfo(); ?>Now open http://serverIP/phpinfo.php in your browser. you will see PHP version and other configuration details like below. Step 14 » For testing Database connectivity through PHP. Create a file dbtest.php in /var/www/html/ and add below code . Kindly replace with your root password in the below code . Now access http://serverIP/dbtest.php . you should get congrats message. Thank you very much, working perfectly! what does it says? whats the error on php? and how do you cume to phpMyAdmin log in ? 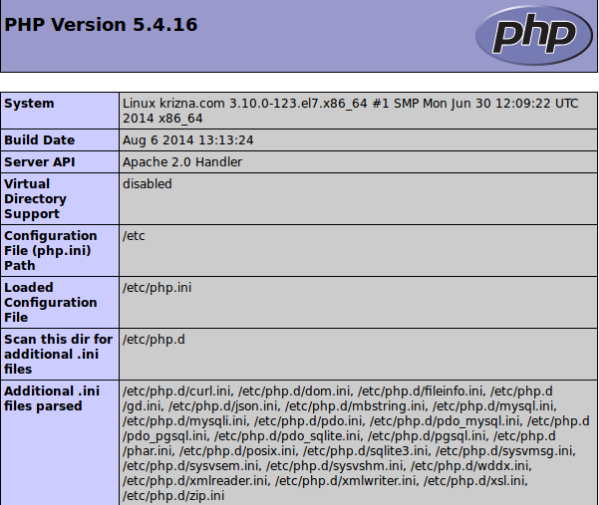 i try efter my ip number phpMyAdmin but not get log in ? do i ned downloade folder from phpMyAdmin.com and put in var/www/html foldern ? or thet som als comando and phpMyAdmin efter ip number i ned to get to php log in and make data base ?